Yesterday saw the official opening to the public of the new council building at West Offices. It’s all shiny and bright over there. Here’s a photo of their old place, taken last month, before the building was emptied. I walk past often on my way into town, and sometimes cast a glance down from the pavement level to the basement offices. They always looked quite cluttered and kind of homely. Or maybe just reminded me of my home, as they too had to prop open their old sash windows. In their case with an empty washing up bowl, I noticed, on one occasion. It wasn’t only the windows needing attention. The whole place looks a mess. What could look so splendid – a stuccoed curving 1830s terrace – is a mucky-looking dump with green patches near its drainpipes, bits of stone crumbling and weeds growing from its balcony. Plenty of character though. 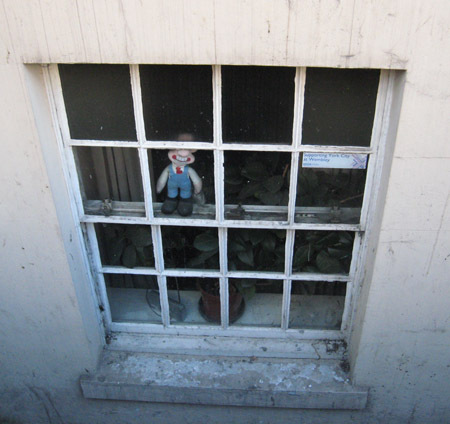 Including this character, recognisable to most as Wallace of Wallace & Gromit fame, positioned at the window, peering out, apparently desperate to escape. Windows covered in grime, but just visible behind him what looks like a row of rubber plants. No doubt dusty too, as they invariably are. This place has certainly seen better days. It was once quite posh. And will be again. Though it will take a long time to restore to its former glory, to remove the marks left behind by decades of office workers adding their own personalised touches, like the window sticker attached to this basement window. BBC Radio York: ‘Supporting York City at Wembley’. Like everything else here, a bit faded now.